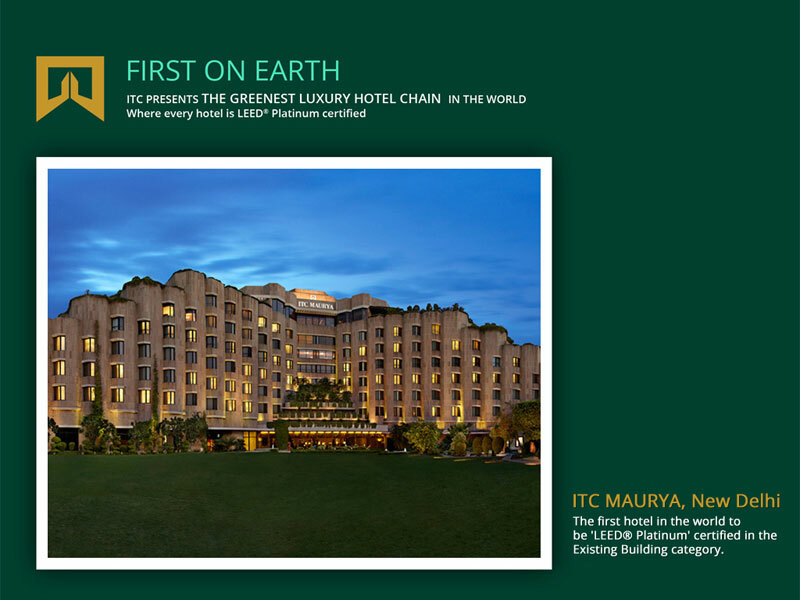 One of the fastest growing hospitality chains in India, ITC Hotels is a trailblazer in Green Hoteliering with all ITC's Premium Luxury Hotels being LEED® Platinum Certified. 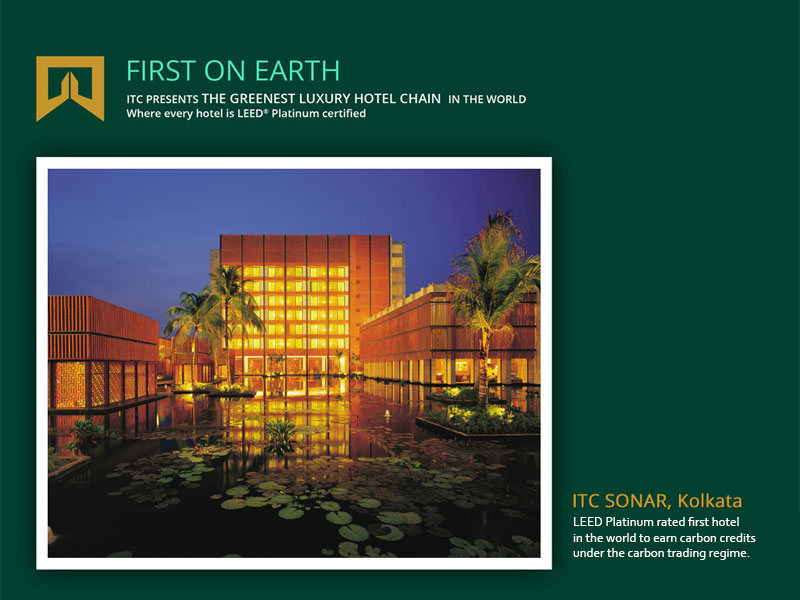 Launched in 1975, ITC Hotels, India's premier chain of luxury hotels, has become synonymous with Indian hospitality. ITC Hotels pioneered the concept of 'Responsible Luxury' in the hospitality industry, drawing on the strengths of ITC groups' exemplary sustainability practices. Responsible Luxury personifies an ethos that integrates world-class green practices with contemporary design elements to deliver the best of luxury in the greenest possible manner. 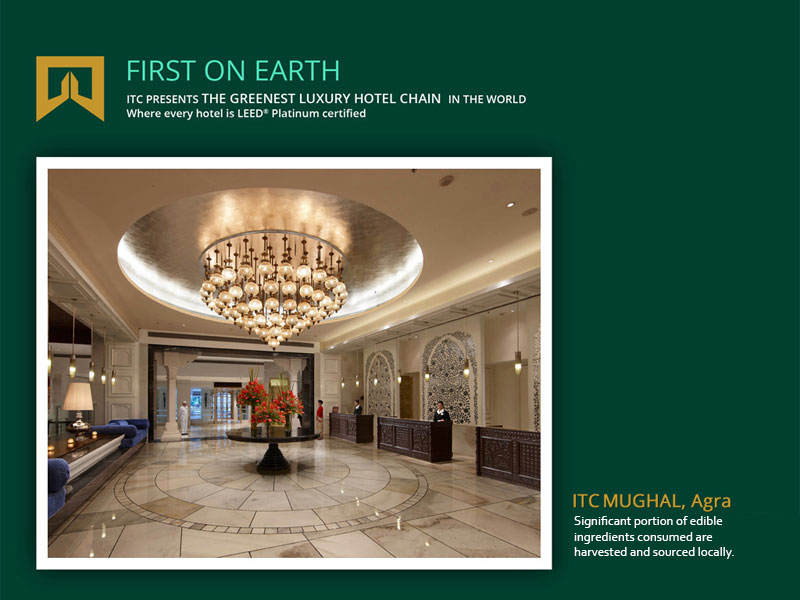 The Responsible Luxury commitment of ITC Hotels blends elements of nature to deliver a unique value proposition to guests, conscious of their responsibility to be planet positive. 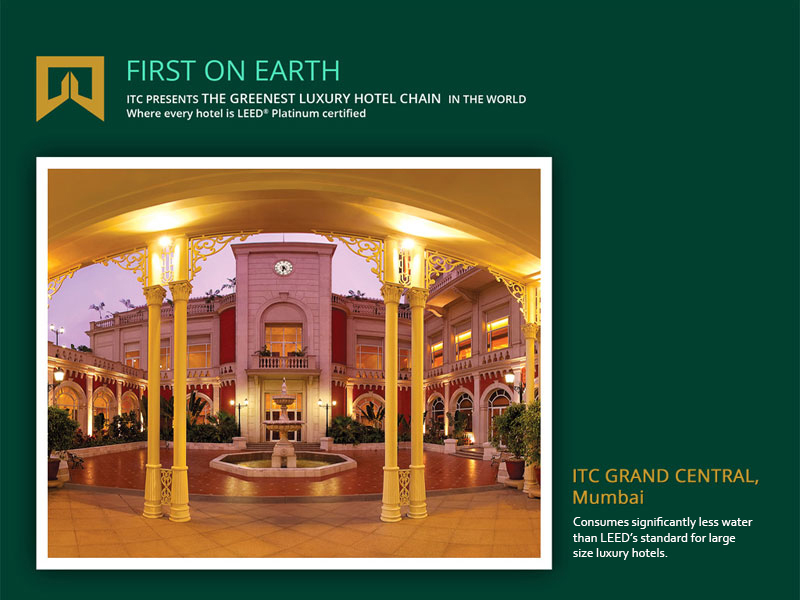 Today, these unique interventions have made ITC Hotels a trailblazer in green hoteliering with all its premium luxury hotels LEED (Leadership in Energy and Environmental Design) Platinum certified. With more than 100 hotels in over 70 destinations, ITC Hotels has set new standards of excellence in the hotel industry in Accommodation, Cuisine, Environment and Guest Safety. ITC Hotels has an exclusive tie-up with the 'Luxury Collection' for twelve of its hotels. ITC Hotels - Luxury Collection are super deluxe luxury hotels located at strategic business and leisure locations. The hotels which are part of this collection are: ITC Grand Bharat in Gurugram. ITC Grand Chola in Chennai, ITC Maurya in Delhi, ITC Maratha in Mumbai, ITC Sonar in Kolkata, ITC Grand Central in Mumbai, ITC Windsor & ITC Gardenia in Bengaluru, ITC Kakatiya in Hyderabad and ITC Mughal in Agra, ITC Rajputana in Jaipur and recently launched ITC Kohenur in Hyderabad and ITC Grand Goa Resort and Spa in Goa. WelcomHotels offer five-star hospitality for the discerning business and leisure traveller. Currently there are 14 hotels under this brand namely, WelcomHotel Dwarka - New Delhi, WelcomHotel Bella Vista - Panchkula-Chandigarh, WelcomHotel Jodhpur - Jodhpur, WelcomHotel Rama International - Aurangabad, WelcomHotel Vadodara - Vadodara, WelcomHotel Grand Bay - Vishakhapatnam, WelcomHotel Khimsar Fort & Dunes - Rajasthan, WelcomHotel The Savoy - Mussoorie, WelcomHotel Kences Palm Beach - Mamallapuram-Chennai, WelcomHotel Coimbatore, WelcomHotel Bengaluru, WelcomHotel Chennai, WelcomHotel Pine N Peak and one Sheraton New Delhi Hotel - offer warm, comforting services to the global traveller and a chance to connect. Fortune Hotels operates mid-market to upscale properties in the first-class, full-service business hotel segment all over India, in major metros, mini metros, state capitals and business towns, promising business and leisure travellers a wide choice of destinations and accommodation. WelcomHeritage brings together a chain of palaces, forts, havelis and resorts that offer a unique experience. WelcomHeritage endeavours to preserve ancient royal homes and the historical Indian grandeur and opulence for the future Indian generations. WelcomHeritage provides a fine range of hotel services inside these architectural legacies present across India. 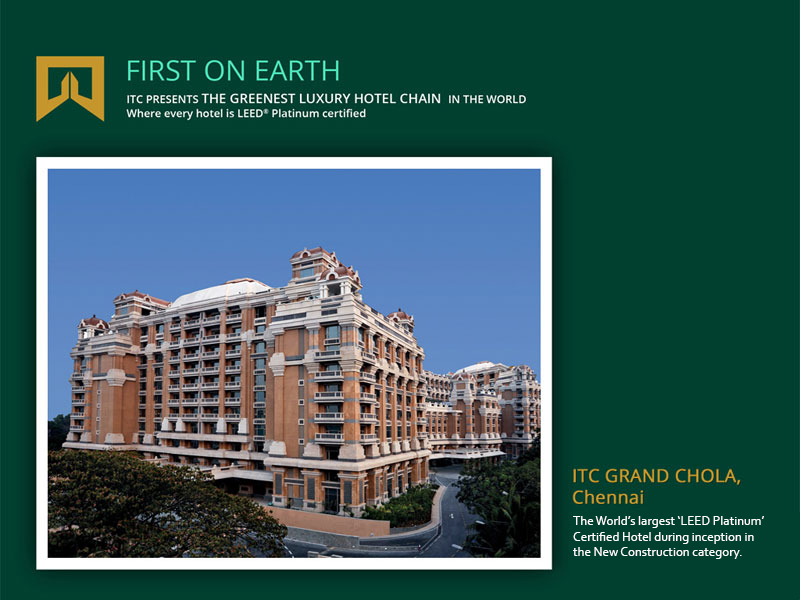 ITC Hotels has set standards for excellence in the hotel industry by pioneering the concept of branded accommodation. The chain has developed four brands of accommodation 'ITC One', 'Towers', ‘Eva’ and the 'Executive Club' to differentiate between the needs of various travellers and provide the highest levels of service. ITC Hotels is one of the first to introduce branded cuisine WelcomCuisine - in India. The Bukhara and Peshawri restaurants give epicures the rugged, outdoor cuisine of the Northwest Frontier Province. Dakshin has brought together the highly evolved cuisines of the four southern states- Andhra Pradesh, Karnataka, Tamil Nadu and Kerala. Dum Pukht is a unique restaurant dedicated to a 200-year old culinary tradition of slow cooking food, in sealed deghs. The fragrance of the meal becomes an invitation befitting royalty. Today the connoisseur can savour these delicacies across the country. The sumptuous fare at K&K comprises a mouth-watering array of kebabs and a wide range of dishes from all over India. These dishes can be categorised as Quarmas, Qaliyas or Salans. Rated high by food connoisseurs all over the world, ITC Hotels takes exceptional pride in showcasing its internationally renowned cuisine. West View brings a careful selection of western cuisine s from the remote France chateaux, grill houses on the East and West coasts of America, rosy kitchens of English manors, leisurely Mediterranean villas and bustling German marketplaces. The Pan Asian serves specialties from China, Thailand, Mongolia, Japan, Indonesia, Vietnam and Malaysia. Royal Vega - Royal Vega presents a delightful offering of delectable vegetarian food from the magnificent Royal kitchens of India. Shanghai Club - the 'Shanghai Club' at ITC Grand Central presents erstwhile Shanghai's pot pourri of authentic Chinese regional cuisines in a contemporary ambience. Tian-Asian Cuisine Studio - the new gourmet experience, unfolds a confluence of creative Asian flavours and textures. Discover avant - garde cooking techniques at Tian with culinary masterpieces from Japan, Korea, Thailand, China and beyond. Avartana - Avartana exemplifies an exclusive blend of traditional and progressive renditions of Southern Indian cuisine, which is rooted to the gravitas of the unique tastes, aromas and flavours of southern Indian spices. Kaya Kalp (meaning rejuvenation of mind, body and soul in Sanskrit) spas are class apart for those who seek to combine luxury with an exclusive and enriching experience that uplifts the mind, body and soul. Kaya Kalp Spas offer indigenous and well-known therapies from across the world, to deliver a memorable spa experience. The Kaya Kalp Spa experience is available at all the ITC Luxury Collection Hotels. 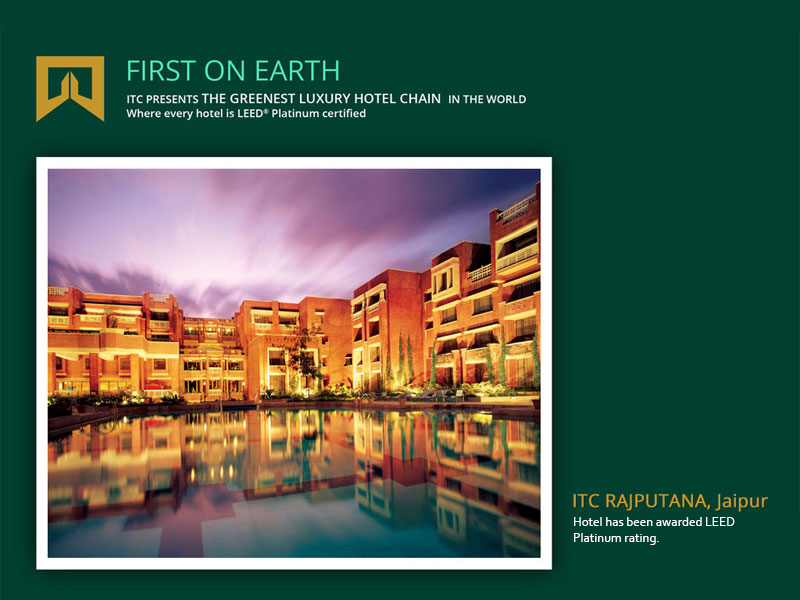 ITC Green Centre in Gurgaon, the headquarters of ITC's Hotels Business is the physical expression of this commitment to sustainability - Ecological, Social and Economic. This building is one of the world's largest green buildings with space of over 170,000 square feet. The ITC Green Centre which was earlier declared the largest LEED Platinum rated office space in the world in 2004, was re-certified in 2012 as the world’s highest rated green building with Platinum certification by the US Green Building Council. ITC Hotels has established that if provided with an opportunity to work and become self-sufficient, people who are differently-abled can significantly contribute to the workplace, families and the community. ITC Hotels has taken a positive step in this direction by employing people who are differently-abled across its hotels. ITC Hotels believes that everyone should be treated with sensitivity and empathy. The models it has created have been effective and have succeeded in sensitising other employees to the needs of those differently-abled. Keeping in mind their specific skills, many differently abled have been employed in diverse functions like housekeeping, teleworking, bakery and as musicians. Special badges for the visually impaired, whistles for hearing impaired employees to communicate in an emergency and sign language classes for the staff to communicate with them are just a few examples of how ITC Hotels has created an atmosphere of sensitivity and caring. ITC Hotels has also published a booklet aimed at sharing experiences with the rest of the corporate world and laying down a step-by-step guide to demystify the perceived complexities around employing persons with disabilities. ITC Hotels' strategy of benchmarking against international standards has won its hotels many laurels. ITC Grand Bharat voted No. 4 amongst the World's Top 100 Hotels & Resorts at the Conde Nast Traveler US Readers' Choice Awards 2015. The retreat was also voted the No. 1 Resort in Asia. ITC Grand Chola was awarded the 'Signum Virtutis' - Seal of Excellence as the pinnacle of luxury in the 'Hotels & Resorts' category at the Seven Star Global Luxury Awards in Malaysia on June 14, 2014. 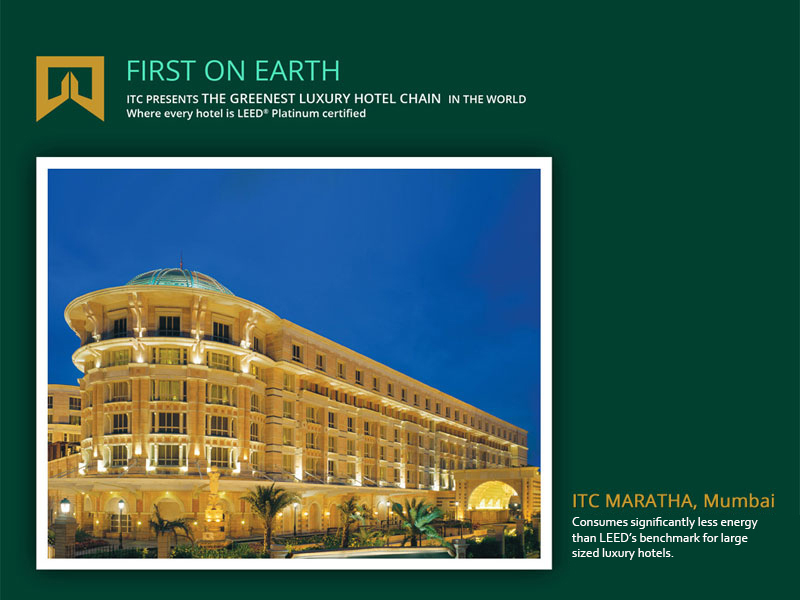 ITC Hotels - Greenest Luxury Hotel Chain(2011 - 2012) to be LEED platinum certified by US green building council & India green building council. 'Most Trusted Hotel brand in the Public Choice Honours category awarded at the Times Travel Honours 2011, organized by Times of India. Miele Asia Awards - Top 20 Restaurants in Asia - Bukhara, Dum Pukht and Dakshin - 2011. 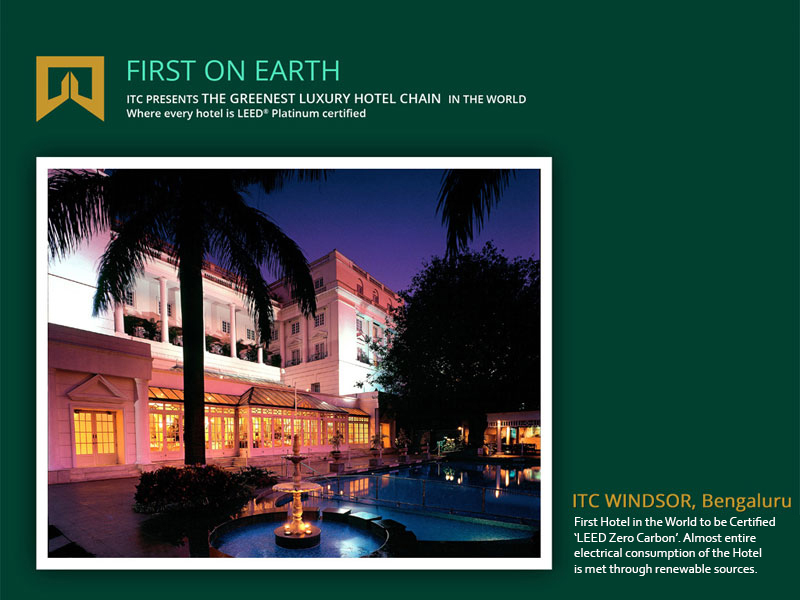 ITC Hotels is the only chain in India to have the maximum number of ISO 14001 certified hotels. ITC Hotels was named the Best Premier Hotel Brand at the Galileo-Express TravelWorld Awards 2008 & 2006. 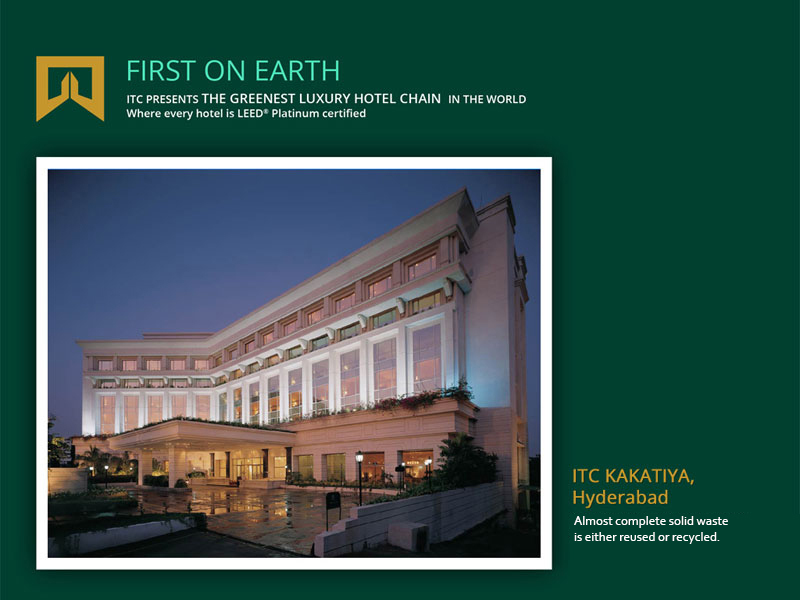 ITC WelcomHeritage won the Best Heritage Hotel Brand award in 2006. ITC Maurya, New Delhi received the award for 'Best Luxury Hotel' at the Star Hospitality Awards 2007-08 and the NATIONAL TOURISM AWARD 2007 for 'Best Eco-Friendly Hotel' from Ministry of Tourism. WelcomHotel Sheraton New Delhi won the Golden peacock Award 2008 for Environment Management. It was also conferred the '6th Annual Greentech Safety Award' in the Service Sector for the year 2006. The NCPEDP-Shell Helen Keller Award 2008, 2007 and 2006 to ITC Hotels for the vision, policies and practices demonstrating the belief in equal rights and gainful employment for persons with disabilities. The PATA Gold Award 2005 in the Corporate Environmental category for the WelcomEnviron initiatives of ITC Hotels. ITC Green Centre - World's largest green platinum rated building (2005) by US Green Building Council. ITC Sonar, Kolkata has been declared as one of the best hotels in the world by the Association of British Travel Agents (ABTA) in the April 2004 issue of its magazine 'Business & Travel'. ABTA also rated Dublin amongst the top 20 bars and Bukhara the best restaurant in Asia and the finest Indian restaurant in the world. 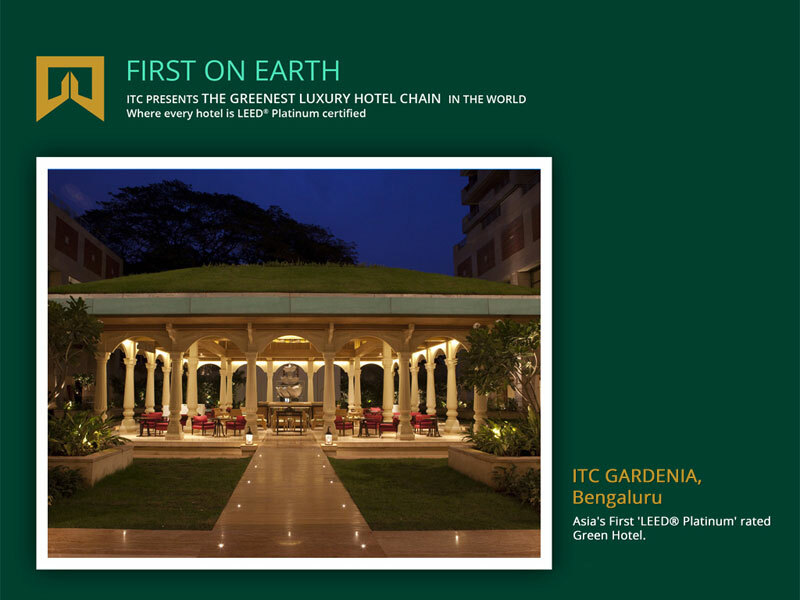 ITC Hotels awarded as the best chain for 'Eco Responsible' practices in the year 2004. ITC Maurya, New Delhi is the only hotel in India, to have won the British Safety Council's 'Sword of Honour' thrice. ITC Mughal at Agra was Asia's first winner of the Aga Khan Award for Architecture. Asia's first 'Golden Fork Award', was also bestowed, by the International Food and Wine Writers Guild on Bukhara and Dum Pukht restaurants brands. Bukhara has been rate among the TOP 50 restaurants in the world at the S. Pelligrino Top Restaurants of the world for 4 consecutive years. Kaya Kalp ITC's indegenious spa brand has been rated by Tatler and Conde Nast Traveller among the best spas in the world.